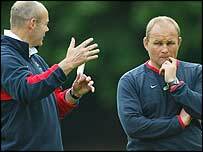 If technical expertise or tactical acumen are the key requirements for the England coaching job, Andy Robinson has nothing to worry about in his new role. Jon Callard, the former England full-back, believes the Rugby Football Union has made the right choice in giving Robinson the top job. Callard, an assistant coach to Robinson at Bath, says Robinson is the ideal man to replace Sir Clive Woodward. The 40-year-old played an integral role in helping England lift the World Cup last year following his appointment as Woodward's assistant in June 2000. Robinson has been England's main man on the training pitch for four years, putting into action Woodward's blueprint for how he wanted the national team to progress. The former Bath flanker is as driven and uncompromising a coach as he was a player and his attention to detail has been key to the rise of the England team. And Robinson, who has been acting head coach since Woodward stepped down last month, has been given the job permanently and is charged with the task of overseeing the transition of a side that has failed to shine since that glorious night in Sydney. "Robbo is passionate and emotional about the game but tactically and technically there is no-one to rival him in this country," Callard told BBC Sport. "He is the guy at the coal-face and that in-depth knowledge is invaluable. "He will be better placed than anybody because he knows what is needed to take England to the next level." Woodward was a breath of fresh air when he was appointed and his ground-breaking ideas in preparation and training turned his side into world-beaters. 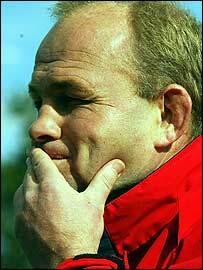 But Robinson is also a deep thinker about the game and played his part in the sparking new life into English rugby. When he was at Bath he signed Dan Lyle, who was brought up playing American football, and used his skills to help the squad. "What Robbo did at Bath was a revelation. He brought a technical dimension that was missing from the previous coaches. "Robbo's ideas will be trialled and trialled before being brought in. "Without meaning to sound disrespectful, Woodward was a maverick. "He would look at other things and say 'right we are doing that'. Robbo will do those things but will cover every base before introducing them." The singled-minded approach Robinson will bring to the job has already been demonstrated by the way he dealt with scrum-half Matt Dawson. Dawson was dropped from Robinson's training squad after refusing to attend training because of business commitments. "Andy does not shirk away from big decisions," said Callard. "Every coach would have loved to do what Andy did. "There was instant respect after the Dawson decision from everybody. "You can't have players dictating when and where they turn up, and Matt realises that. It was a great starting point for Andy. It resonated through the squad." His first task will be to restore the confidence and belief that was the hallmark of England's play, as well as rebuilding a side that has lost so many players since the World Cup. He will also be without the inspirational Richard Hill, the last member left of England's fabled back-row, while new skipper Jonny Wilkinson has yet to hit top form following his return from injury. "He will bring a winning style and with a new wave of guys coming into the team, that's the most important thing," said Callard. "He is perfectly placed. He has won the World Cup. "He knows what is needed to move things forward to keep parity with the other nations."